**This is another adapted Waitrose recipe. Easy to make and absolutely delicious. I never use to be a fan of gnocchi until I tried this! 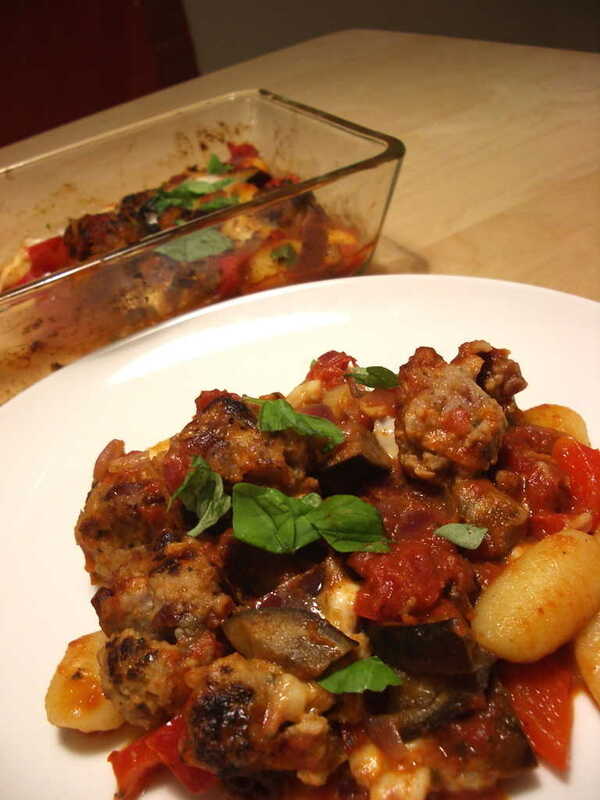 The recipe calls for fresh pork meatballs, which are not so easy to get hold of. Instead I tried using some good quality sausages with seasonings like cranberry or apple or herbs and they worked really well. ** 1. Squeeze the meat out of the sausages and roll them into 2 - 3 cm meatballs. 2. Heat the olive oil in a large frying pan and fry the meatballs until lightly browned (sausage meat burn easily, so keep turning them carefully and use medium heat). Leave the meatballs to the side. 3. Fry the diced onion in some olive oil until softened, add the vegetables and fry for further 3 - 5 minutes. 4. Add the meatballs and stir in the tomato sauce. Cover and cook for 5 minutes. 5. Meanwhile, cook the gnocchi according to the pack instruction and preheat the grill to medium heat. 6. Drain the gnocchi and stir into the meatball tomato mixture. Transfer the whole thing into a heatproof dish, and tear the mozzarella cheese into pieces and evenly scatter over the top. 7. Grill for 4 - 5 minutes, until the cheese has melted, bubbling and slightly brown. 8. Garnish with basil and serve! The dish is best served with some fresh green salad! ENJOY!